Fleet Stats – Bad News and Good News…..!! Stats don’t lie BUT they are what you make of them…! There has been much said and written recently around the health of the flying 15 class and having looked at the results across all events over the past 4 years the trends do not appear to be too positive. Key events such as Nationals seem to constantly be in School summer holidays and tend to be at venues which are not family friendly. The number of people attending 2 or more events is down 35%. There are over 40 different clubs across the UK represented each year. This is not aimed as a criticism of the Class but merely to illustrate a very real problem that needs addressing. I acknowledge that the solution is not so simple, yet one needs to be found. I do not want the Class to deteriorate any further, we have had some fantastic racing this year, and that should continue! First and foremost people go to events to sail! Nevertheless events should also consider families, there needs to something off the water for spouses and children. This is equally as important as the quality of the sailing venue itself. Think carefully about event locations and make them an attractive proposition! 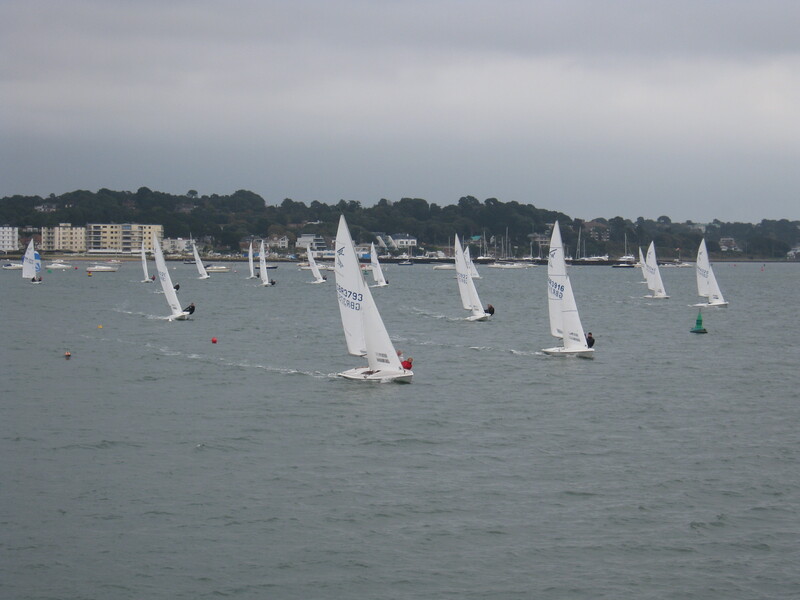 A rather grey overcast day greeted todays 17 teams, with a shifty and gusty southerly wind. Race Officer Iain Lamey set an Olympic triangle course, taking boats to the corner of Brownsea island and across to Poole quay before returning to the Race Platform. Conditions were such that all crews came ashore with tails of opportunities missed.The fleet remained closely bunched and close racing was to be had throughout. A leading group of four boats including Pete and Jo Allam, Chris Gorringe and Nadia Hose, Martin Lewis and Mike Riley and Crispin Read-Wilson and Steve Brown, fought hard for the win with each crew at some point holding the lead. 3rd Pete and Jo Allam. This weeks report and pictures, picture credits, winners, Bob Alexander, sailing scene Iain Lamey. After last week’s disappointment of no racing, this week competitors were greeted by a shifty and gusty north easterly breeze. 14 boats lined for the start with the fleet getting away first time. Race Officer Iain Lamey set a well thought out triangle, sausage, sausage course, making best use of the water available. The first windward leg being short meant there was plenty of jocking for position around the first mark. 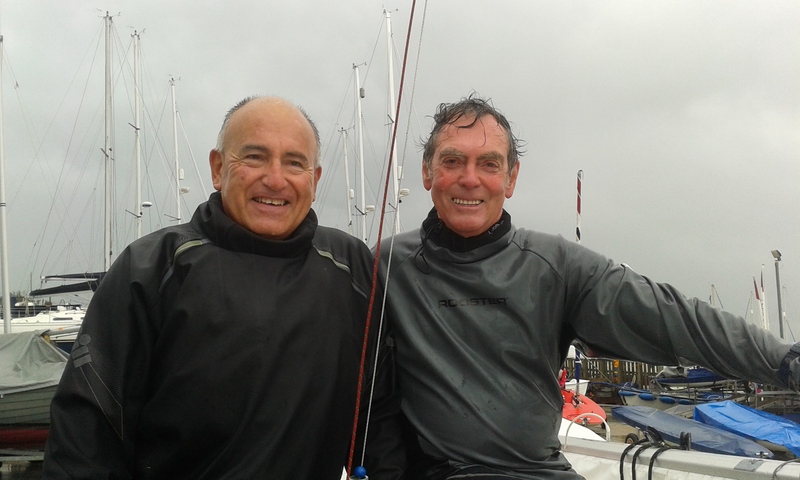 Gerry Philbrick and Rob Walford showed good skill to make ground on the first triangle and round the leeward mark second behind Dave Tabb and Chewey Sherrell. Dave and Chewey gradually extended their lead to finish first. Southern Travellers Round 3 at South Cerney……!! Report of the 3rd round of the 2015 Southern Traveller Series, sailed at South Cerney SC over the weekend 6/7 September. 11 boats took to the water for the F15 Open event. There were 4 races on Saturday in light winds and a final two races on Sunday morning in very light winds. Well done to the Race Officer, Dave Whittle, and his team getting all 6 races completed in the fickle conditions. 1st place overall and 1st classic were visitors Bob Tait and Mick Musgrave from Broxbourne sailing club. 2nd place overall and 1st Silver were our very own Andrew and Ali Wallace with 3rd place overall going to Neil Bartholemy and Jim Reid from Middle Nene sailing Club. 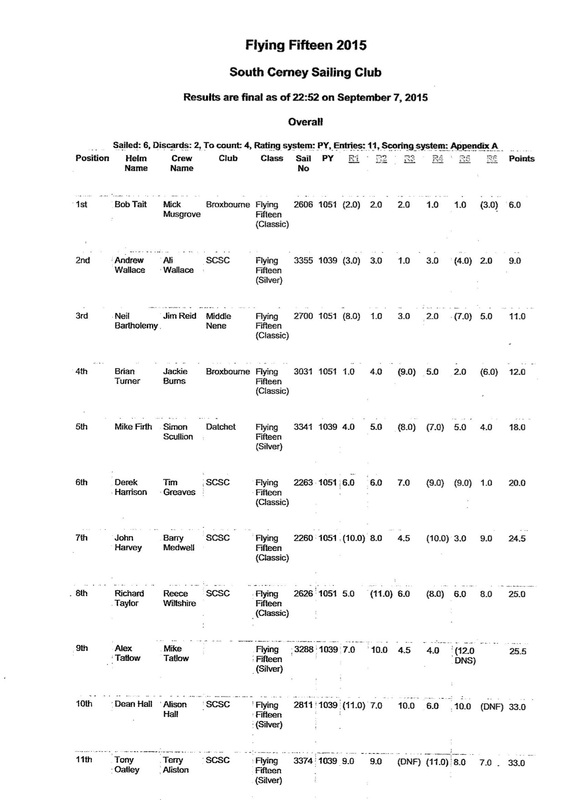 1st SCSC boat outside of the top 3 was Derek Harrison and Tim Greaves in 6th place overall. The visitors were very complimentary about the event organisation, the race management, and the fantastic meal on Saturday night. Well done to everyone involved. The final STS event will be sailed at Middle Nene SC on 3-4 October, when the prizes will be presented to the overall winners of the Classic, Silver and Open Fleets. Charles in Action at the Worlds….!! Adam Kingston on Worlds and The Like….!! For a multitude of reasons we did not travel from Australia for this event, although we are planning to do the next event in New Zealand – as long as the logistics of an Australian Nationals in Esperance and a Worlds, 6 weeks later in NZ with a 4,000 km drive thrown into the mix before packing into containers for the NZ journey. In relation to the comments regarding future regattas, I understand the limitation on time and also the cost issues etc, however, I’m unsure of why we would be considering cramming a World championship into 4 days? The limitation seems to be the desire to have 7 races, why would we not look to hold a regatta with 12 or 14 races. The World’s fleet only competes on a bi-annual basis, surely everyone would prefer to increase the amount of sailing? The Irish Nationals Coming Up ….!! Worlds Now From Patrick Condy….!! so a few comments on the last section of the post from a sports development student. As far as the next generation of the class, there is next to no movement in younger people to join the class in anything other than classic level, me and three friends all own and race classics. there needs to be a push to get more younger people involved in the class. Realistically it is not going to be possible for a younger person on the whole to buy a brand new boat and drive it. so having a matching programme where boat owners can go for experienced and trained crew would be beneficial. For example if the class where to run training events for younger people who are keen to be involved in the class, thus building up time in 15s and understanding of the systems then there would be a large database to pull names from if new owners or people who are short of crew can phone up and find someone in their area. The location of the worlds, having the worlds closer to home this year has made me and a few others consider the cost as it would be less to reach them in comparison to having them else wear. I’m aware that they must move to where the fleets are but I think this should be pointed out when trying to increase participation from a younger generation into what can be an expensive class that having the worlds further afield is a barrier to participation. As far as PR goes, having a PR rep for the week who would work for the class is something other class such as the half tonners have used and it works well to promote the class. having daily updates on the top end of the fleet, but also of the battles that happen throughout the fleet. by using video footage of the class making it look appealing, and then promoting it to the correct demographic will give the class exposer, but promoting through just Facebook and a website is no longer good enough. the class need to engage with other outlet forms to increase exposer and to increase participation. Worlds – David McKee’s View….!! I am in agreement with Hamish’s comments, we should review our Championships format. For us the French trip took 15 days door to door and I think we sailed on 7 days a total of 13 races. The stay in Morgat was enjoyable and we were made very welcome however this was poor use of time. I do not think we need more races, we just need to fit in more over a shorter time.I would be in favour of a 2 races a day schedule for the World Championships which could therefore be sailed over say 4 days maximum. I think the target time should be 75 to 80 minutes for the first boat and agree that we should only use triangles when there are the right conditions. There should be provision to sail 3 shorter races on a day if necessary. One other point is the amount of time taken by Scruiteneering. We should open a debate about how we deal with this. It is very time consuming to carry out the full Scruiteneering process and this is difficult to manage as there isn’t an even flow of work. the Scruiteneering process this time effectively took 4 days . is there a better or more efficient way this can be accomplished whilst still complying with our ISAF status. I don’t know the answer but like all involved would like to find a way of making this an easier process for all. Worlds – Hamish Speaks ….!! Thought I would share my thoughts from the F15 worlds, having just returned from Morgat. Now we only did the worlds, giving another week to the pre-worlds was never a possibility. That said it still took 10 days for us. In my view simply too long. This is not a criticism of Morgat but a view on what appears to me to be somewhat archaic F15 championship rules. The intention was to run one race per day, maybe two on one occasion (7 in total), the last Friday being a spare day (of use if you have to pack a container but unnecessary to anybody else really). Now we were unlucky with the weather – too little wind and then too much so some days were lost. But my question is why do we as a class insist on one race a day, the PRO had a target time of 90 minutes with max 120mins, not much actual racing time. We ended up using the inside course every day at Morgat (why?) so the race course was circa 20mins for the beach, with a 1pm start! I believe we need to change as a class, over a week we could easily set a timetable to have 2 or even 3 races per day, starting in the morning, maybe 12 races, 2 discards? And also why in non-planning conditions do we insist on reaching? We did a few races where in the places 5-15 or so from what I could see (and maybe others) there was no place changing for both reaching legs – so boring, processional, just burning time. Windward leeward has to be the way forward in those conditions, surely? I believe we need to modernise as a class, more races, less time needed, better formats, and that’s before we start on any changes to the boat/rig (for another day….). We made a comment that the bulk of the competitive UK fleet appear to have been in the class for a significant number of years, some have done 10-15 worlds…..where is the next generation of F15 sailor coming from and what will attract them to the class and the championships? What will the class be like in 10 years time and who will still be competing? Can I urge the class to re-think and look forward. Now I won’t do the next worlds – 2 weeks or more in New Zealand in February (school term time) is just not going to work for me unfortunately (maybe for the current demographics of the class this doesn’t matter to most?) could we not have had it in Perth, Western Australia over New Year if we are going down under? Final comment we do need to improve our PR and championship reporting, having a wrap up report at the end is all very well but surely we could manage daily reports to Y&Y or the like to keep those back home involved? It might also attract some new faces to the class, who knows? Draycote Sprint Comes Forward a Month….!! There is an email going around the Fleet Captains to announce that the Draycote Sprint, a great one day Open Meeting format, is moving its date forward by one month – to September 19th. Want to go?? Greg Wells Awarded the Uffa Fox Medal….!! The full report on the Worlds has just been published on UKFFA. Sounds like it was a terrific regatta!